The Maserati GranCabrio is equipped with the strength of 433 horse power and a 4.7 L V8 engine that is very much similar with the Ferrari California. It is an upgraded engine from its older sister coupé, the GranTurismo, which hosts a 405 horse powered engine. With a transmission system of 6-speed shiftable automatic, this Maserati is not too much of a challenge for speed test. However, it runs just fine on the highways, having a top speed of 175 miles per hour. Not too demanding, but not so dainty on the run. 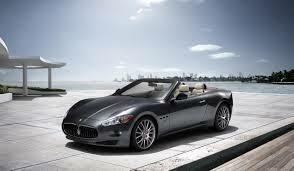 When accelerated, the Maserati GranCabrio is able to reach 60 mph under 6 seconds. Indeed the perfect luxury for not-so-young people. What makes this GranCabrio a favorite among the customers of the Miami luxury car rental is its ability to handle four people in its sleek and slim body. It enables us to have the utmost enjoyment of the ride with family and friends. The seats are also trimmed with tan-colored leather, looking absolutely warm and welcoming. The leather, of course, is of the best in quality from the Poltrona Frau leather. The comfort is further improved with the seats’ ability to memorize positions and adjustable warmth. While comfort is installed for every passangers, another is present in the technology of the long gear shift paddle. The extended length allows smoother ride even in the most uncomfortable bends and breaks. Maserati GranCabrio is what every luxury car rental can offer for a family and friends of four, with intentions of enjoying the most of their leisure moments.